A device called mobility aid or walking aid designed to help walking as well as improve the mobility of a person with a tool. It includes walking sticks (assistive canes), walkers and crutches. 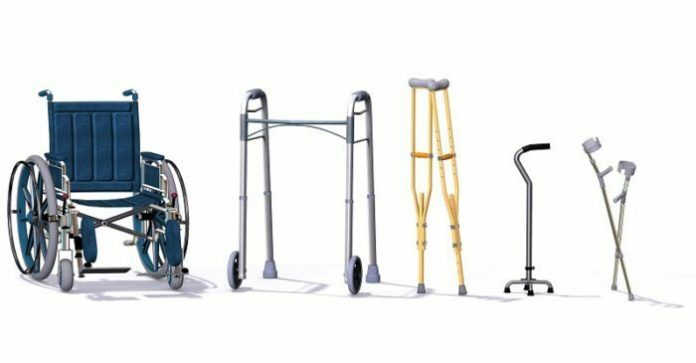 There are different types of walking aids that can assist people to provide wheel-chairs and mobility scooters and for highly disable persons. It can help in long journeys for disable people. For visually disabled people or blind persons, guide dog and white cane uses from a longer period of time. Standard walkers also called pick-up walker which is made of metal, rubber tips four-legged frame. It always has to be moved forward and lifted with each and every step. Standard walkers are very much easier to use than a cane. It gives optimum assistance with balance at the time of requirement. The walker with two wheels on the front and two posts are best for those who have a tendency to fall backward or weak arms. It is basically useful for such type of patients who are having Parkinson’s disease. It usually reduces the risk of falling from the backside. Four-wheeled walkers can be used in the community who can handle the hand breaks. It provides a basket for shopping and a comfortable seat which can help the person to stop and rest. People should be aware of the application of brakes. Although it is very easier to use hence provide the least stability. Appropriate use of canes can help to improve balance through the support base and even it can involve an additional input of sensor. The support area is increased with the help of a cane. It can help in reducing the weight which can play an important role for those who has arthritis or weakness of legs. To reduce bearing weight on one particular leg, crutches are often used in older people. It requires strength, coordination, and balance to use appropriately for those who have an axillary artery. For older people usually, walkers are preferred at the time of weight bearing through one leg. Seated walking scooter can help with normal balance and to give relaxation of lower extremities. It has a bicycle type seat and handles bars and definitely, it can provide much more support than a cane. It is very easier to use compared to a wheelchair. It absolutely looks like a balance bicycle. It can be used as a substitution for wheelchairs and seated scooters for walking. It provides a wheeled device on sits and it may be electronic or manual. Wheelchairs and scooters are preferred for any individual because of balance impairment. With the appropriate use of walking aids, can help to maintain upright move out which can provide stability improvement, engender movement and also reduced lower limb cramming. The walking aid generally uses in low technology mechanical tools. Walking aids can give supports for people who are having joint diseases, muscle weakness and balance issues. How Can Optometry Services Help?